This year we are once again supporting Washington Foodbank and encouraging our shoppers to buy something extra that will help local people over the festive period. 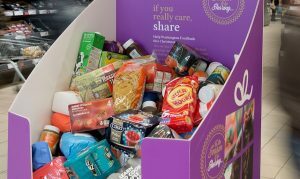 Our Foodbank boxes are in place in Asda and Sainsbury’s. The Foodbank are in need of tinned vegetables, fruit, fish and meat as well as toiletries. If you’re shopping with us, please spare a tin.